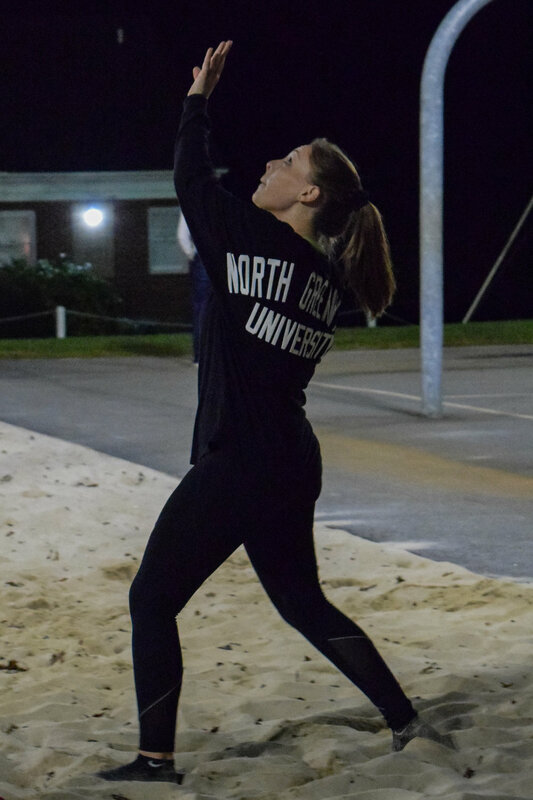 On Tuesday, Oct. 23, 2018, North Greenville University students braved the cold as they played intramural sand volleyball. “Who let the dawgs out?” and “Empire Spikes Back” faced off at 8 p.m. with “Empire Spikes Back” winning the first set 22-20 and the second set 21-15. Junior, Kayla Ward, hits the ball to teammate Hayden Long (junior), in hopes that he assists in getting the ball over the net. Junior, Landon Murray, jumps up behind junior, John Mark Trainer to help make sure the ball gets over the net. Sophomore, Lauren Dibble sets the ball for a fellow teammate to hit over the net. Zachary Clark (senior) and Murray attempt to counteract each others spikes to gain their team a point. Junior, Ross Smith hits the ball over the net to prevent “Empire Strikes Back” from gaining a point. Clark hit the ball back over the net after the serve to begin the volley. Long crouches in order to gain some warmth in the cold before the next volley begins.